Welcome to the Alpine Region around Tegernsee and Schliersee in Upper Bavaria. 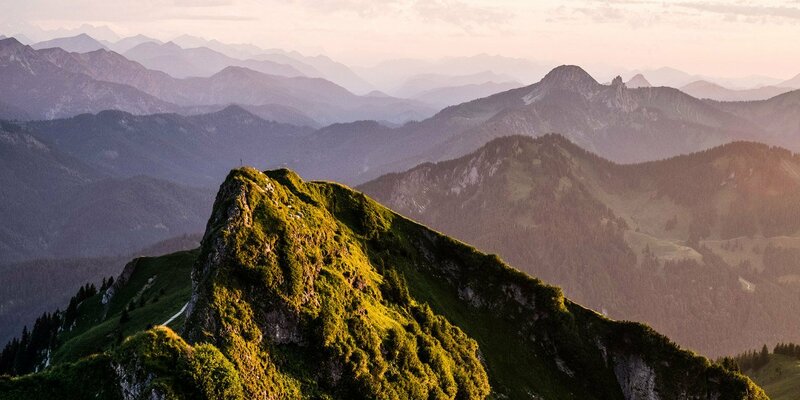 Explore the beautiful landscape of the Bavarian Alps and the living traditions of Upper Bavaria. Just one hour by car from the Bavarian state capital Munich, you can find scenic mountain trails and lodges, typical festivals, restaurants and beergardens. At the foot of the Alps, just one hour by car from Bavaria’s state capital, Munich, you can also explore the natural world even without a car or bike. A holiday world that is wonderful for walking waits to be explored and to be marvelled at, or just simply enjoyed. A hike on the Wallberg or Wendelstein mountains promises joy at the summit with marvellous views. A trip to Spitzingsee, to Valepp or to the romantic Kloo-Ascher valley near Bayrischzell promises walking pleasure without any great exertion beside rippling streams. Experience nature with all your senses and leave behind the day-to-day grind. Loose yourself on walks through in the idyllic landscape steeped in cultural monuments in stages over three days. We offer nature in its purest form to anyone willing to sit a while. Ancient traditions, cultural wealth and a lot of "Gemütlichkeit". There are events you shouldn't miss in Bavaria! Down-to-earth celebrations with lederhosen and Dirndl, float high above in a hot air balloon – If you want to experience a colourful variety of events, you are in the right place in the Alpine region Tegernsee Schliersee! The Montgolfiade is a top event at the start of the year. Over 50 hot air balloons float over the Tegernsee valley every January. The Old Schliersee day of patronage is among the most beautiful and colourful festivals in the Bavarian Oberland. Pilgrims in festively decorated boats row across the Schliersee in honour of the patron saint, St. Sixtus to the mass in the town at the start of August. Guests enjoy genuine Bavarian costume and folk dancing, coupled with beer and Bavarian music, at the countless beer and lake festivals in the region. Christkindl markets open their doors at the end of November; the largest is Rottach Advent directly in the spa resort on the lake, the most romantic takes place in Fischbachau’s monastery’s inner courtyard. Around 6th November, horses and people receive a church blessing during processions of carts, horses and riders in numerous towns across the region. You are therefore left in no doubt that there is always something happening in the Tegernsee Schliersee Alpine region!